North Fork Farm is a small family cattle farm located in the mountains of western North Carolina. It's a family operation which consists of Jimmy and Sheila Greene and their son Seth, all of whom were born and raised in the High Country of Western North Carolina where they call home. Cattle have always been a part of their lives, and they pride themselves in having the highest quality of beef available. They raise their cattle without added hormones or antibiotics. They believe in pasture-feeding with some all natural grain, makes just the right flavor in beef. 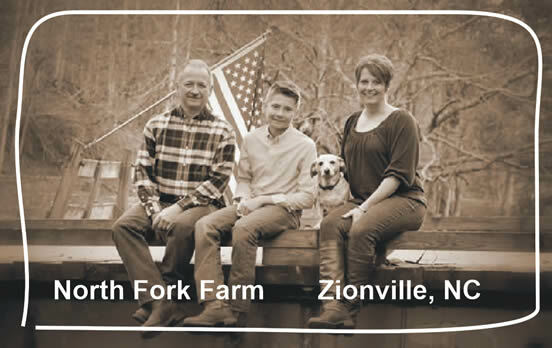 Come Back Shack is proud to support local family farms like North Fork. This table reflects the most current information from our suppliers and our most updated recipes. This table does not reflect manufacturer's "shared equipment" or "shared facility" allergy statements. During our normal kitchen procedures, foods may come into contact with any given allergen or with something non-vegan. For this reason we cannot guarantee that any single menu item is completely free of any given allergen or that it has not come into contact with something non-vegan. That said, we'll always do our best to accommodate you!